How can we use the ocean without using it up? This is the primary question that Ayana Elizabeth Johnson is addressing through her work in the realm of ocean science and policy. 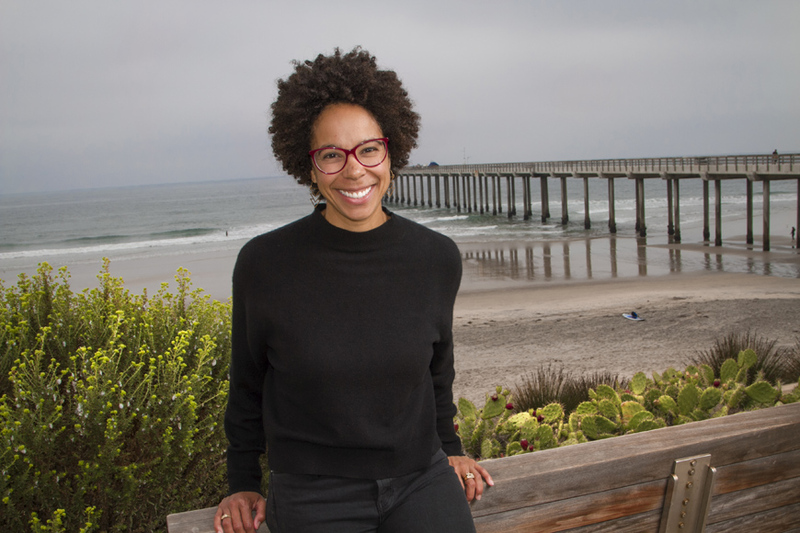 Johnson is a woman of many talents: she’s a marine biologist, policy expert, conservation strategist, and graduate of Scripps Institution of Oceanography at UC San Diego (MS ’09, PhD ’11), where she studied marine biology through the Center for Marine Biodiversity and Conservation (CMBC). She’s also the founder and CEO of Ocean Collectiv, a strategy consulting firm for ocean sustainability grounded in social justice. The impressive alumna and Triton 40 Under 40 recipient returned to campus on Sept. 26 to serve as keynote speaker at the Scripps Student Symposium (S3), an annual research conference organized by Scripps students. Now in its sixth year, the symposium features presentations and poster sessions designed to showcase the breadth of Scripps research to the new class of students. During Johnson’s talk, “The Future of Ocean Conservation: Zoning, Triage, Cities, Inclusion, Culture,” she candidly discussed her career path, her successes and failures, and her experience as a woman of color working in science policy. Johnson has more than a decade of experience working in ocean conservation, and in that time she’s discovered that conservation efforts should focus on people—particularly the poor and minorities along the coast who are disproportionately affected by climate change, overfishing, pollution, and habitat destruction. But humans are also the solution to a healthy ocean, given the right tools and strategies, said Johnson. Her career is now laser-focused on providing these science-backed tools and strategies for clients and public outreach. A Brooklyn native, Johnson first became interested in ocean science during a visit to the Florida Keys as a child. After receiving a bachelor’s degree from Harvard University in Environmental Science and Public Policy, Johnson said she was looking to dive deeper into a field she was passionate about, so she chose marine biology. As a graduate student, Johnson’s research focused on the ecology, socio-economics, and policy of sustainably managing coral reefs. After becoming a certified scientific diver through the Scripps Scientific Diving Program, Johnson conducted extensive field research in the Caribbean and examined the ecological impact of trap fishing and gill nets. She spent countless hours in the water collecting data, but soon found that a critical component to her research was on land, where she met with hundreds of local fishers and professional scuba divers to learn about their needs and views on sustainability. “Counting fish is important, but what I really needed to do was listen to fishermen. And so everything I did from then on was focused on that,” said Johnson, recalling her ‘Aha’ moment. After graduating from Scripps, Johnson held a policy position at NOAA before landing a job as executive director of the Waitt Institute, an organization that partners with governments to “empower communities to restore their oceans.” There she co-founded the Blue Halo Initiative—a science-based, community-driven approach to management of the island of Barbuda—and she led the Caribbean’s first successful island-wide ocean zoning effort. These efforts led to the protection of one-third of Barbuda’s coastal waters and opened the door for Johnson to lead similar initiatives in Curaçao and Montserrat, developed in partnership with the governments and stakeholders. After spending a month of rest and relaxation at her family’s farm in upstate New York, Johnson was refocused and ready to start her next endeavor: opening her own consulting firm for conservation rooted in social justice. In 2017 Johnson officially opened Ocean Collectiv, comprised of a “dream team” of experts spanning science, policy, community engagement, design, film, politics, education, technology, and communications. The team works collectively to design, build, and implement creative and practical solutions for a healthy ocean. Ocean Collectiv just celebrated its first year of business, and Johnson said she is thrilled to see what the future brings. She’s particularly proud of Ocean Collectiv’s recent work with Students Rebuild, a program of the Bezos Family Foundation that mobilizes young people to take action on some of the world's most critical problems, including the health of the ocean. The S3 event organizers said they invited Johnson to give the keynote speech because they were inspired by her work and commitment to conservation in a socially and economically conscious way. 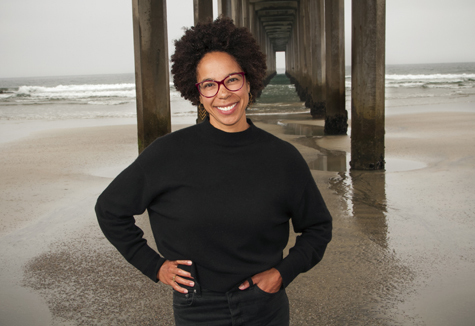 In addition to her work with Ocean Collectiv, Johnson is an adjunct professor at New York University and mentors next generation ocean leaders. In recent years, she has become more involved with political activism, volunteering her time to co-lead the March for Science—an event that drew more than one million people to the streets worldwide in support of science in policymaking. Johnson also shines a light on important scientific and social issues on social media and through her writing, which has been published in HuffPost, the New York Times, the Los Angeles Times, Scientific American, and more. “Many of the reasons that I’ve had doors opened for me—or I've kicked open—happened because of something that I published, so writing turns out to be really important,” she said. As the symposium drew to a close, Johnson encouraged students to use their voices to speak up about issues that affect them—and to register to vote. Whether on social media, through her company, or through her writing, Johnson is actively using her voice and platform to help lift others up too. Following the S3 presentation, Johnson participated in the “Growing up in Science” discussion and Q&A on campus, where she dug deeper into the personal and professional hurdles she’s experienced throughout her career. After the discussion concluded, Johnson reflected on the significance of her visit.